Director Spike Lee is known for making films that comment on social issues while staying true to his hometown, Brooklyn. Movies such as She’s Gotta Have It, Do the Right Thing & Clockers are part of a Brooklyn Chronicles that Lee himself has created. The latest chapter in the Chronicle is a joint called Red Hook Summer. This film that Lee has self-produced is now available in limited release. But can Red Hook deliver as the previous movies? Red Hook Summer follows Flik Royale (Jules Brown), a young man from a cozy middle class Atlanta background, as he spends the summer in Red Hook with his grandfather, Enoch Rouse (Clarke Peters). Rouse is the enthusiastic Bishop over a colorful flock (including skilled organist & Deacon Zee played by Thomas Jefferson Byrd). The combination of the Bishop’s persistent attempts to convert Flik coupled with his strict “old school” ways with his feelings of culture shock cause him to hate his summer in Brooklyn. But his summer starts to look up when he meets a fiery young woman named Chazz Morningstar (Toni Lysaith), who shows Flik that Brooklyn can be a pleasant place to be. In the process, he tries to figure out how people could believe in God, especially after learning about the past. Red Hook Summer’s camerawork is really impressive. The movie was shot on the Sony F3 cameras & it gives of a very vivid picture that’s just is nice of a picture as if it was shot on an Alexa or Red camera. The picture in Red Hook Summer is extremely clear and very vibrant. It makes the colors pop out, bringing added life to the frames. The camera positioning was very interesting to see. The manner in which the camera is framed, you’re able to see many religious images that’s very symbolic of what’s happening in the story. And it is the only movie I have seen that does the whole light flare entering the frame camera trick justice. It’s was not overdone but just the right amount in the right moment. (Take note, Star Trek, & Transformers) If you’re not into religion, the film should be seen just from the filmmaker’s point of view. I was very impressed with how it was shot in regards of camera placement arrangement and film compass and the shot composition. The cinematography in Red Hook Summer was among the best that I have seen all summer. 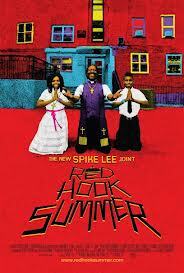 Red Hook Summer takes the fish out of water concept & adds his little touch of Lee to it.. The acting & dialogue is pretty grounded in reality. Clark Peters gives a commanding performance as Bishop Enoch, the enthusiastic bishop of the Lil Piece of Heaven Baptist Church. As Jules Brown & Toni Lysaith perform as Flik and Chazz, they show a lot of promise. While there were a couple of scenes that seemed flat, the dynamic between the two young actors is realistic, when not charming. The story flow allows Flik to be introduced to various characters including an intimidating gang member named Box played by Nate Parker, an alcoholic deacon known as Deacon Zee played by Thomas Jefferson Byrd and a couple of appearances from Spike Lee himself as he reprises the role of Mookie from the classic Do the Right Thing. Despite very minor plot holes in the movie, Red Hook Summer takes Flik as well as the audience on an introspective commentary on religious culture & attitudes through the Lil’ Piece of Heaven Baptist Church while giving a visual tour of Red Hook. The language is spicy at times, and there are some very mature elements including a perturbing plot twist that can shock and frighten you. However, it’s not to the detriment of the movie. In fact, it raises a serious question while building off of the questions the movie built up.